Rangers forward Lee McCulloch admits release clauses in some of his team-mates' contracts could be "a big problem" for the club. Several members of the Ibrox squad negotiated terms that allow them to leave for cut-price offers as part of a temporary wage cut deal in March. 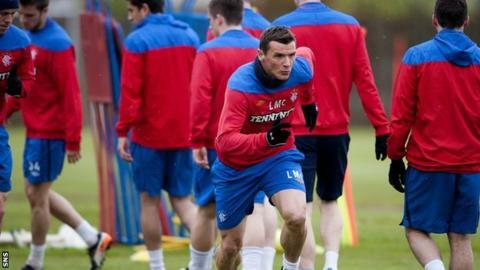 McCulloch has no intention of leaving himself but fears others may go. "We just want the group to stay together," McCulloch told BBC Radio Scotland's Off the Ball programme. "We've won doubles every year, apart from last year when all the mess started happening. "We've proved we're winners and we just want everybody to stick together. "I'll be back next year, I don't want to go anywhere else. I want to stay and play. I'm just praying everyday that everything gets sorted. "The big worry is the players that can move for silly amounts of money. That's maybe a big problem, time will tell." The wage settlement was just one chapter in an eventful season, during which Rangers entered administration amid mounting debts and received a 12-month transfer ban for bringing the game into disrepute. The Scottish FA-appointed judicial panel, who imposed the embargo on registering players over the age of 18, has since been told by Lord Glennie they did not have the power to hand out such a punishment. And Rangers now await a verdict on what replacement sanctions will be dealt by the panel, while the club could also face possible Fifa action for taking the matter through the civil courts, rather than the Court of Arbitration for Sport. A Scottish Premier League investigation and the outcome of a long-running tax tribunal, which both concern how Rangers paid players over a 10-year period, are also pending. "It's a bit of a nightmare, we just want everything sorted out and to be able to come back in for pre-season with everything ready to go," added McCulloch.